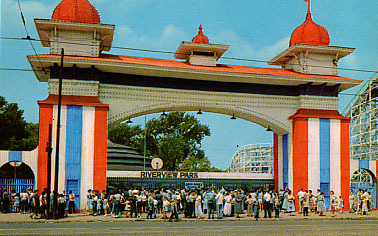 Chicago's Riverview Amusement Park was one of the most popular and famous amusement parks ever. After thrilling patrons for 64 seasons, it quietly closed its gates in 1967 without even having a goodbye party. This site is dedicated to the preservation of its history and memory. Copyright 2000-2011 by Sharpshooters Productions, Inc. Please obtain written permission to use any content on this page.